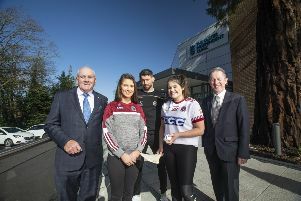 Tyrone still have a sporting chance of playing Division Two hurling nest season, but they will have to try a second time to take the big scalp of their more experiendced Donegal neighnours after a pulsating promotion-relegation play-off at Owenbeg ended in a 4-13 apiece draw on Saturday. Tyrone had trailed by eight points in the first half but once again the real character of Mattie Lennon’s side was evident as they fought back and led going into the last seconds. A harsh free awarded by Cavan whistler James Clarke against Justin Kelly, who had himself been fouled, was pointed to take the tie to extra-time after Tyrone had overcome a slugglish start to come close to causing a surprise. The Red Hands were leading for most of the overtime sessions, but found themselves on the brink of defeat late in the day but, as the game was poised on a knife edge, calm captain Damien Casey kept his cool to secure the replay with a point deep in stoppage-time.